We get it. You’ve got employees and need to track their time, but you don’t really want to pour any money into any timekeeping software. That’s why we created SwipeClock’s employee timekeeping spreadsheet. Just click to get your free copy and start tracking time today. I hope your business isn’t one of them. 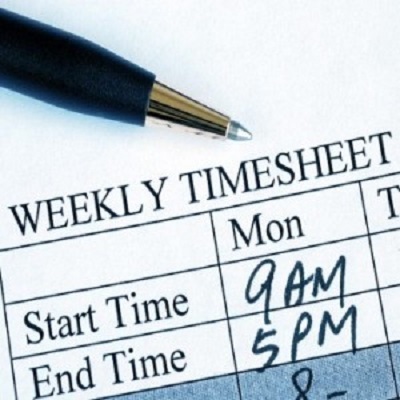 But, if you are, we’ve got you covered with our employee timekeeping spreadsheet. The spreadsheet eliminates the hassle of trying to read or interpret employee time-punch data. Not only are clock-in and clock-out times available and easy to read, but break times and total shift hours are also easy to read. It’s no secret that handwriting as a whole continues to deteriorate. It doesn’t look like a problem that will be solved anytime soon. The increase and accessibility of technology and automation mean that handwriting will continue to become a less-important skill. In addition, the fact that schools no longer teach handwriting means that future employees aren’t likely to have great handwriting either. No more calling, or tracking down employees for missing or illegible information. Our excel spreadsheet quickly shows if a field is missing or absent. Employee income totals won’t populate if the employee is still clocked in or if they failed to clock in for a shift. That means that employees won’t miss a punch before turning in their time cards. This will save your payroll department processing time. Upgrading to an Excel Spreadsheet for your time tracking means that your physical time cards won’t get misplaced, misfiled, or lost. Did you know that on average it costs a business $139 to replace a missing document? When that lost document is a timecard, the cost could be much higher, especially if the document is discovered missing during a labor dispute or in the advent of an employee complaint. Did you know that most employment and labor laws are written to assume employer guilt when the employer has incomplete or missing documentation? That means that even a single missing timesheet could mean thousands of dollars in penalties for your business. At the very least, it will mean extra time and lost productivity while your employees track down and attempt to duplicate the information to the best of their abilities. Information can be copied and pasted into the payroll system instead of manually entered. This will save some of the time that payroll employees spend processing payroll. Employees should be provided with the ability to ask questions and get any clarifications they need regarding the use of the spreadsheet. Check that the clock in times doesn’t run over a 24 hours period. For example, if you started work at 8 am and are clocking out at 5 pm, make sure you haven’t input 5 am as your clock out time. Using an Excel spreadsheet is a definite step up from manual time cards! However, there are a few things that you should be aware of. These can cost your company in extra wages, penalties, and disputes. The Excel Timekeeping Spreadsheet tracks time to the closest 30-minute increment. That means that if your employees are 5 or 10 minutes late, they will still earn wages for the time they were late. This can cost your company money in unnecessary wage. Human nature is to exaggerate in one’s behalf. That means that even honest employees tend to not notice exactly how late they were or how often they have been late. As a result, time theft is something that nearly all businesses deal with. On average employers overpay employees an average of 4.5 hours each week. If you are using a spreadsheet to track time, it is important that you plan for those extra hours and understand that spreadsheets tend to average nearly twice as many excess wages as other higher-tech forms of timekeeping. 2. Retention guidelines and procedures are vital! Since you are keeping your timecards in Excel, that means that it is up to your business to maintain permanent records of the employee’s time. You should have a system where you backup all your timesheets every week. Without this system in place, you are at risk of losing them. That could happen if you get an angry employee who willfully deletes timekeeping records. It could happen with a server or desktop glitch or virus. It could happen with a physical emergency such as a fire, flood, hurricane, or other storm or natural disaster. Or it could happen with a technology failure. But no matter how it happens, your business is still held responsible for those records. The Department of Labor and all 50 states relative Department of Labor or Workforce enforcements hold that a business is liable for missing employee records. Some states have extremely costly fines for missing documents. 3. Track Federal, Local, and State Labor and Employment Laws regarding employee timekeeping and payroll requirements. Are you familiar with Federal Meal Break laws and the requirements for tracking and retaining timesheets? Don’t forget about your local state and city sick leave laws or secure scheduling laws. All of these laws require specific reporting, tracking, and retention requirements. In addition, if you have employees who work in multiple locations (Column C) make sure that you accurately calculate the minimum wage for each location that your employees work in. Some cities require a minimum wage for employees even if the business is not located within that city. 4. Once the employee has submitted the spreadsheet, make sure that you create a permanently locked file of the data. This will help to ensure that the information cannot be altered or made fraudulent in the future. It will also help to ensure that questions of legality and accuracy don’t come into play. You can save the spreadsheet to a PDF for a more permanent copy or in Excel, you can permanently lock a specific sheet or an entire spreadsheet. If you are looking for a higher tech (easier) solution that will also save you money in wages and wasted payroll and HR processing time, just fill out the form below. We’ll give you some information about other options we offer!